Fog lifting over the Mystic River. Thick fog lay heavy over the Mystic River for the annual Coastweeks Regatta at Mystic Seaport Museum, Mystic, Connecticut, last Sunday morning. 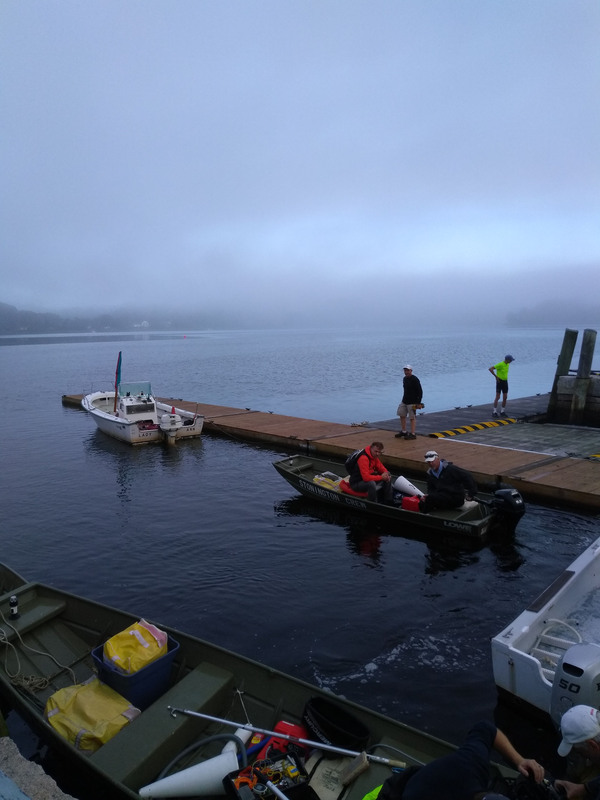 As soon as the sun had burnt off the fog, the 27th regatta could begin, only a little delayed. The weather became ideal for a regatta – the river was like a mirror. 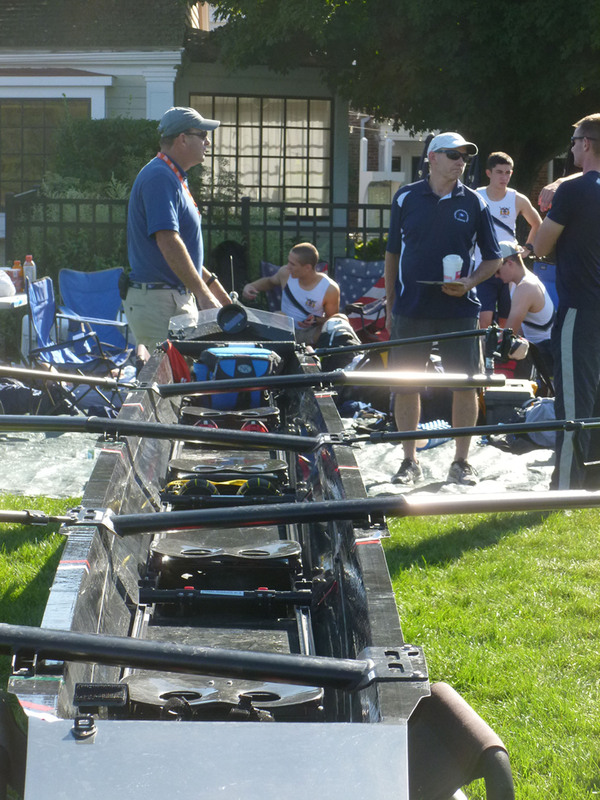 Coastweeks is the regatta that starts the New England head race season. The start of the 2,000-metre course is just north of the Interstate 95 highway bridge and the finish is at the Museum’s north lawn. 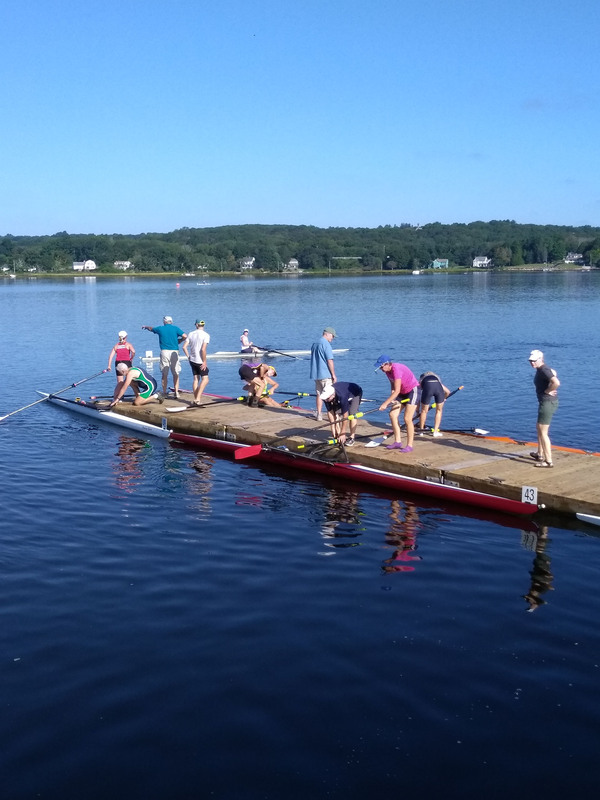 The competitors, which this year numbered 120, regatta general Pete Tebeau told HTBS, are local and regional juniors, seniors, master rowers and collegiate crews racing in singles, doubles, pairs, quads and fours. Perfect weather for a rowing regatta – blue water, blue sky. I bumped into Chris Gasiorek, who is in his second year as Vice President of Watercraft Preservation at Mystic Seaport Museum. He is a graduate of the U.S. Merchant Marine Academy (USMMA) at Kings Point and was once the academy’s Sailing Master and Director of Waterfront Operations. The academy’s rowing team was competing at Coastweeks, so Gasiorek introduced me to the school’s rowing coach, Derek Hartwick. Coach Hartwick, who is a native of Canada, has been the head coach for USMMA’s men and women rowing teams for 13 years. The school’s rowing teams started coming to Coastweeks after one of the 2006 graduates, ‘Dean’ [Constantine] Macris, who is from Mystic, suggested that Hartwick should bring the rowers to Coastweeks at Mystic Seaport Museum. Chris Gasiorek (left) talking to USMMA Coach Derek Hartwick. 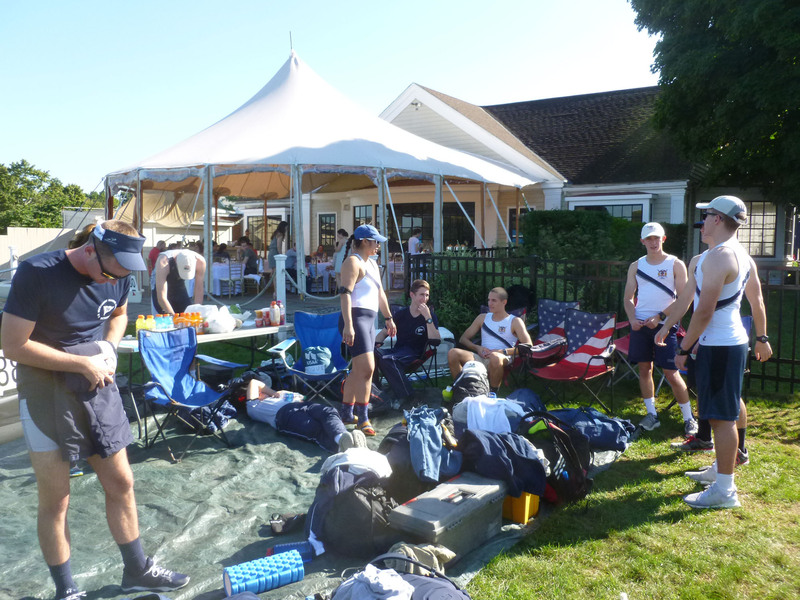 So which regattas do the USMMA’s rowers go to? How about the spring season? ‘In spring, we go against the Division II and III schools as in fall, and at the end of the spring season at the Dad Vail Regatta in Philadelphia,’ Hartwick said. 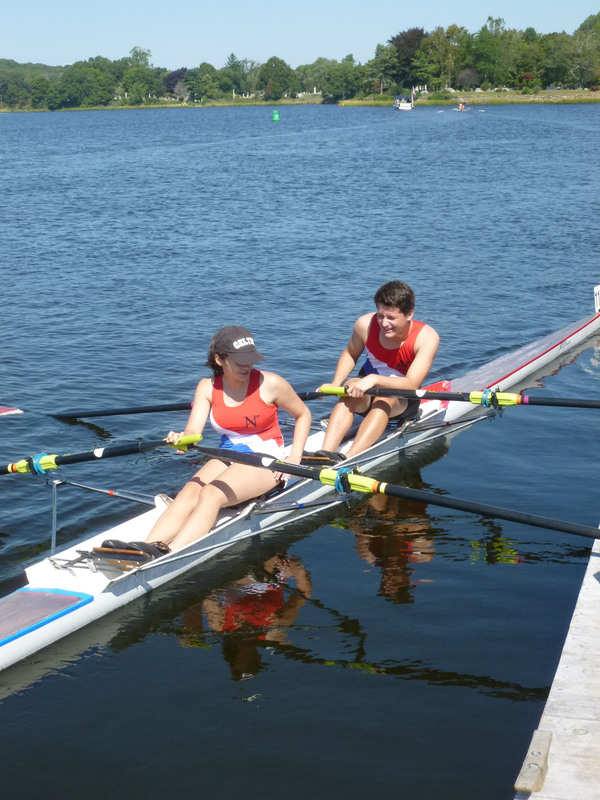 At Coastweeks, Holmes is rowing in a four. So, is he more comfortable in a four? Has he ever tried a sculling boat? 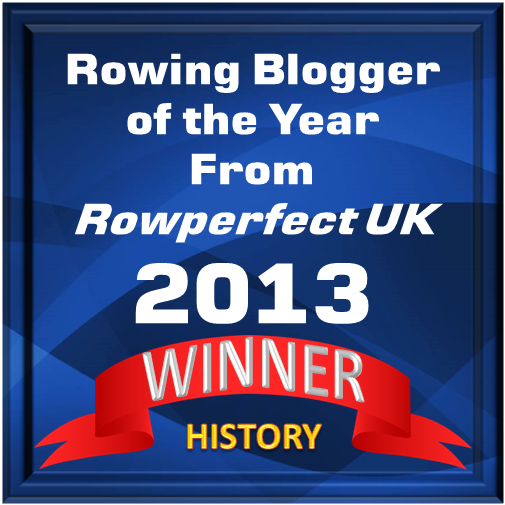 ‘I have not tried sculling yet, but I would like to learn. Most of my racing as a novice, in spring, was in an eight. I’m probably most comfortable in an eight, but I have raced in fours at regattas and I know that I’m well capable to handle a four,’ Holmes remarked. In which position does Holmes row in an eight? ‘In the beginning of my novice season, I was near the bow, and by the end of spring, I was near the stroke seat, I was mostly at 7,’ Holmes said. 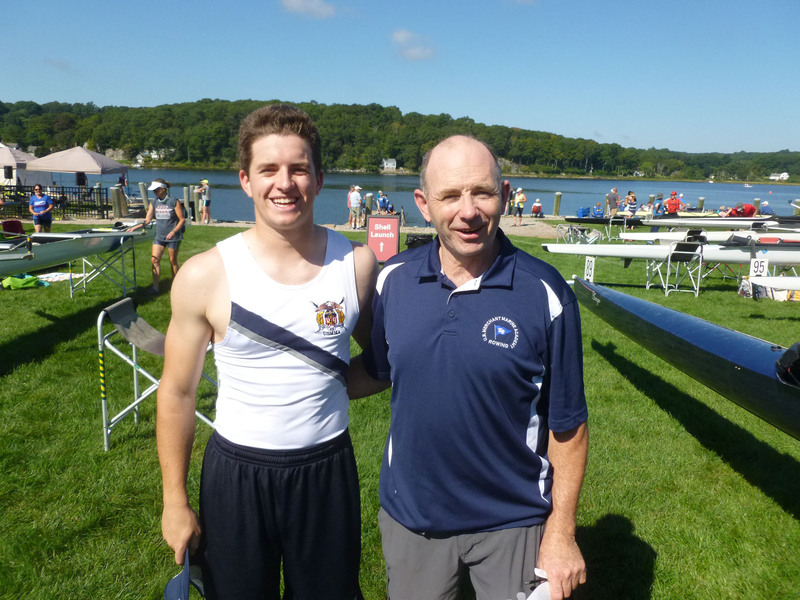 USMMA oarsman Kevin Holmes (left) with Coach Derek Hartwick. At last year’s Coastweeks, I had the great pleasure to meet a local duo, Sofia Priebe and Bob Berry. 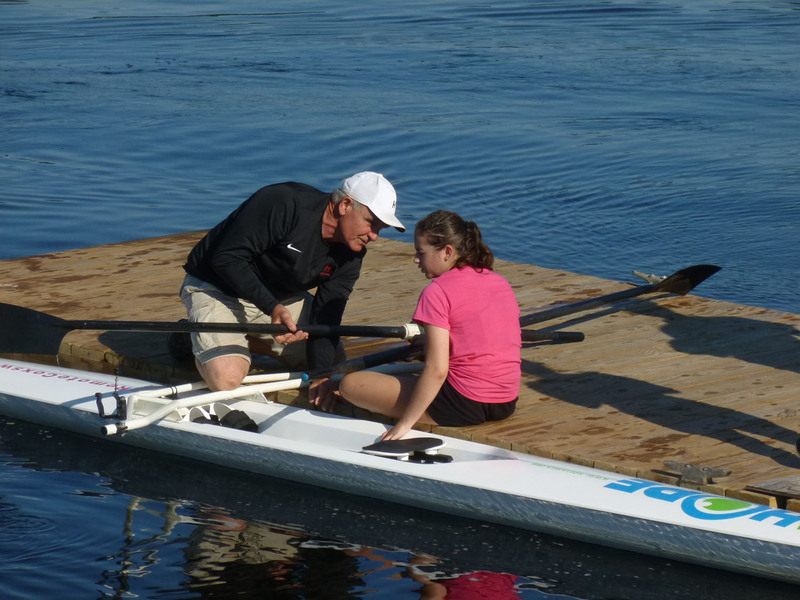 Sofia, who is blind, can race in a single scull thanks to her coach Bob’s innovation, “The Remote Coxswain”. Under a little box aft of Sofia’s boat is the ‘coxswain’, a remote-controlled rudder, which Bob controls from a launch, which is following Sofia’s boat. 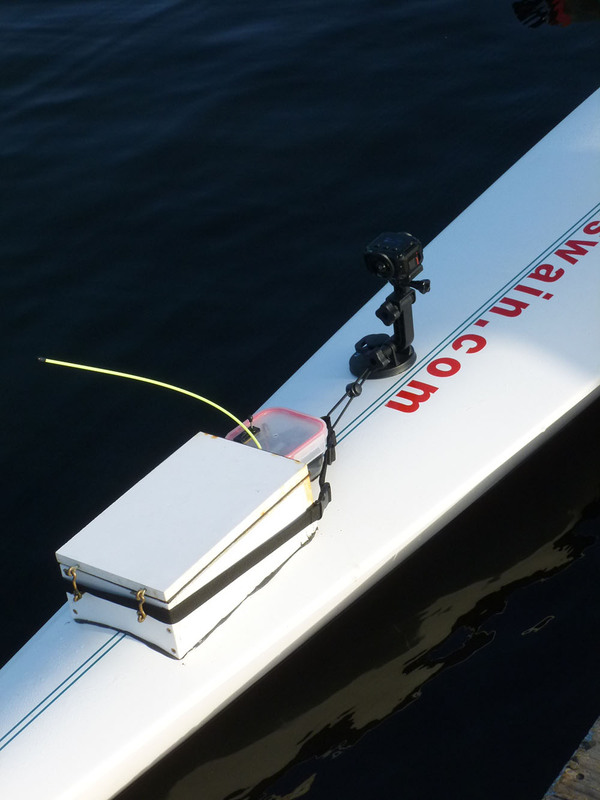 I wrote about this revolutionary idea last year in “26th Coastweeks Regatta: An Inspiring Story of Rowing in the Dark” (see also “Sofia Priebe and Bob Berry are Making Waves”). 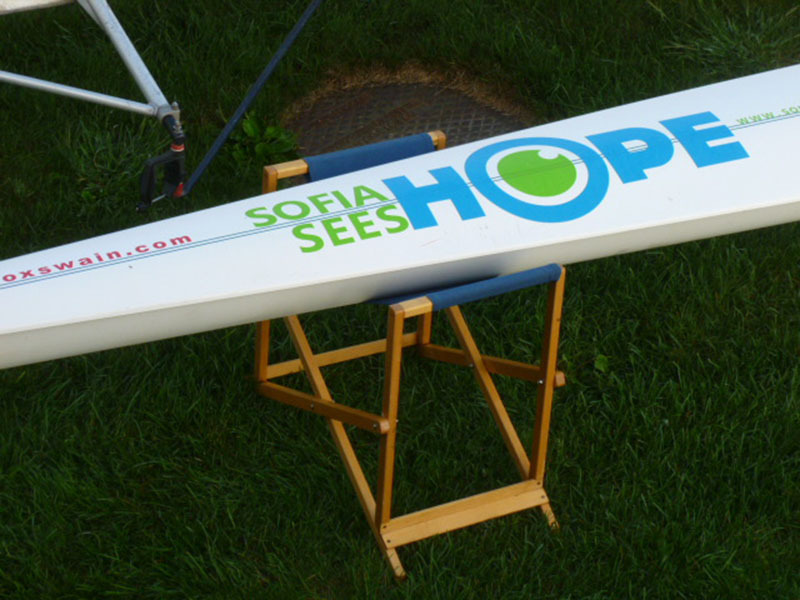 Sofia Priebe’s boat, “Sofia Sees Hope”. 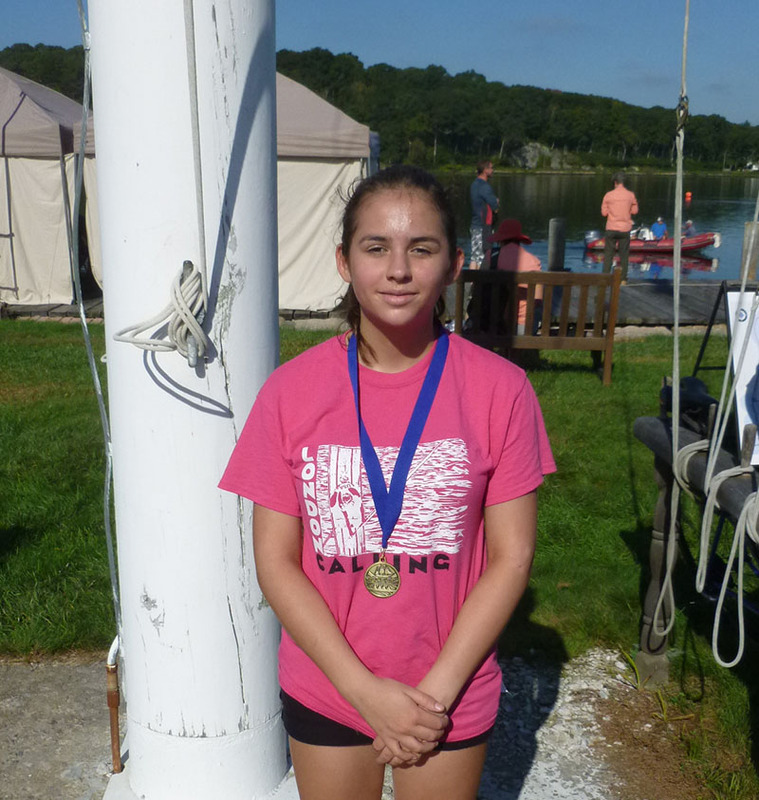 Although, Sofia, who is now 15, took a break from rowing during the first half of 2018, she was ready to race in a single on the Mystic River last Sunday. Please note, Sofia was not rowing in a race for adaptive rowers. With the organisers’ permission, Sofia started as the last boat in her heat, so Bob could steer her down the course from a launch. At one point, Bob’s launch got stuck in a sand bank, but he was still able to steer Sofia’s boat. There were two other young women, both 16, who raced in the heat. ‘Sofia won the race with a 16.22 seconds margin,’ Bob said. Coach Bob is having a chat with Sofia after her single sculls race. Sofia with her gold medal from the single sculls race. Rowing in the single, Sofia rowed for her own non-profit Sofia Sees Hope, an organisation that Sofia’s parents Laura Manfre and Charles Priebe started in 2014, which aims to help not only their daughter, but also other children who have been impacted by blindness. Her single scull heat was not the only race Sofia rowed at Coastweeks. She also rowed in the last race of the day, youth mixed double, together with Fabrizio Roberts, a club mate from Noank Rowing Club. Fabrizio rowed his first race a year ago, at the 2017 Coastweeks, he told HTBS. On Sunday, Sofia and Fabrizio came in at second place. ‘It was a good race,’ Fabrizio said. Sofia and her partner in the double sculls, Fabrizio Roberts. You will find a full Coastweeks Regatta result list here.